Presumably, the upward trend during his stay with each team would be a causal factor on the poor performance of the teams after he leaves. Or the poor performance is perhaps because the new GM couldn’t do his job as well as Gillick himself? It’s not like Gillick started with everyone he had during his reign here, who’s to say he wouldn’t have kept it up had he stayed longer? There’s a follow up to this that I think is even more fascinating. Phils just named Amaro as Gillick’s successor…it will be interesting to see what he does with so much inherited talent in the lineup, whether he tries to get younger quickly or focuses more on other aspects of the roster. Maybe we will have a hint by whether or not he attempts to resign Burrell…I wonder if Gillick would have resigned Burrell if he was sticking around. How about one more line…the average age of World Series winners along the same period on the horizontal axis…combined hitters and pitchers would be fine. Looks like an age chart for Jamie Moyer. Hitters are up there though, especially in Baltimore. ok, I am dim this morning. Look like Gillick is staying on with the Phils as an advisor so the worries about him lording over Jackie Z seem to be dead. I dunno, he was advising the M’s when Phillies GM. Or the poor performance is perhaps because the new GM couldnâ€™t do his job as well as Gillick himself? 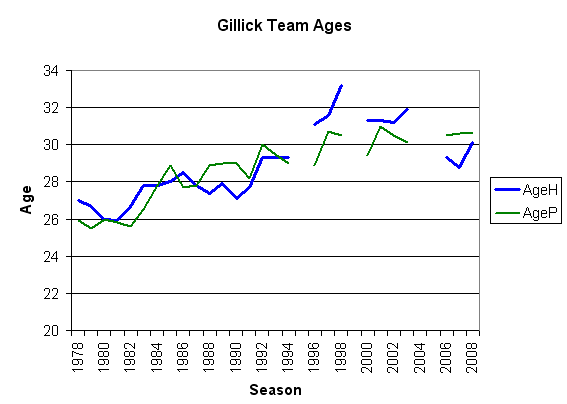 But that ignores the message in the chart, that Gillick leaves teams with significantly older rosters than when he started. whoâ€™s to say he wouldnâ€™t have kept it up had he stayed longer? If that were true, we’d expect to see an example of where he took a team that was long in the tooth and retooled them to be a young contender. Since he has never done that, one must conclude that isn’t the way he works.